And here’s another of my “quilts from panels” series. This fabric really struck me as fresh and wintery. The panel and border are “Holiday Wishes” by Henry Glass. The red and green are also Henry Glass fabrics, but from other collections. And the gray is Kona. It was 50″ x 65″ before washing. And I love, love the unrelated glittery tree print (Robert Kaufman) that I found for the back. All of the quilting is with white Bottom Line, except for the red and green on the border, which is Magnifico and Fantastico. Each block has a large snowflake quilted on it, surrounded by strippling. This was almost totally ineffective. Next time I would use a very heavy thread/yarn to do a snowflake outline in couching or bobbin work. The gray border turned out much better. I think it turned out to be very fun and festive. Look for this soon in my Etsy shop. Categories: Finishes | Tags: christmas quilt, Evening in the Garden, holiday wishes, superior threads, Valerie Root | Permalink. “Summer Stars on Fawn Lake”, the mystery quilt designed by Charlotte Hawkes, is finally finished! We started cutting for this last November, began piecing it in the new year, and finished up assembling the top in May. I made the smaller version (3″ stars!) that finished at 79 x 88″ with the borders. This is the first one of these where I used a dark background. I had a lot of dark batik scraps from a space quilt I made a long time ago. I bought a little more to make enough, and the “feathery” batik for the borders and backing. The rest was scraps, especially bright, multi-color and juvenile scraps. 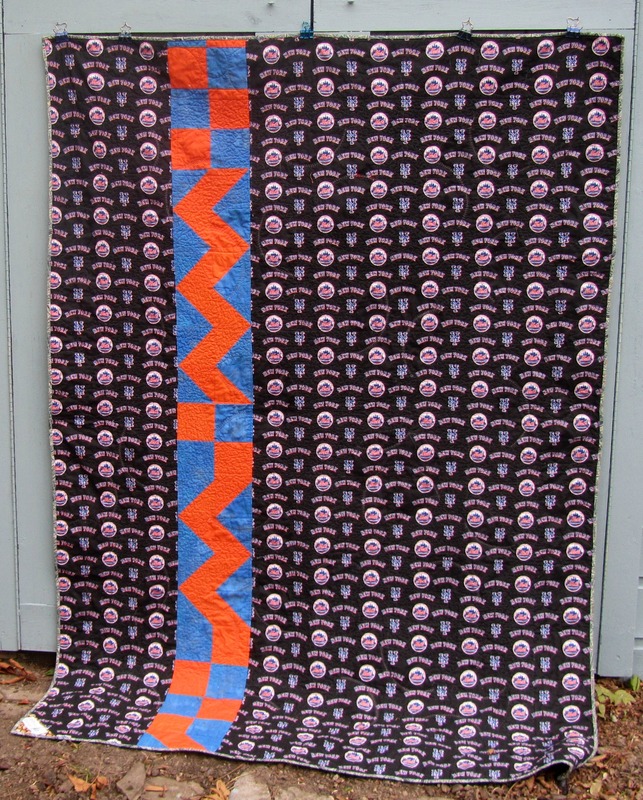 This is quilted with black Bottom Line on the bottom, and black and purple Bottom Line and purple Art Studio Colors on the top. The effect is pretty subtle, but it can be seen up close. I needed a thread that would blend well with the dark batik, but not be too dark on the bright fabrics. So purple was my neutral. Can’t wait to see what Charlotte has up her sleeve for next year! 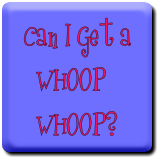 I’m linking up to Whoop Whoop Friday at Confessions of a Fabric Addict. Categories: Finishes | Tags: Charlotte Hawkes, Evening in the Garden, scrap quilts, Summer Stars on Fawn Lake, superior threads, Valerie Root | Permalink. I used the last of our rapidly melting snow to photograph this new quilt. This started out as a way to use up some scraps, and it grew from there. That was when this quilt got demanding. It didn’t like the background fabric I had for it, so I had to buy the golden snowflake fabric (on sale!). So much for using my stash. Then it told me it needed a curvy bias design in the border. And then, of course, it needed wavy edges. More bias binding. Sheesh. But I love the result. This is roughly 60″ square. Where have your quilts been taking you? Categories: Finishes | Tags: Evening in the Garden, four patch star, star quilt, superior threads, Valerie Root | Permalink. Last week I finished the Poinsettia Quilt, and I’m really happy with the result. It’s 60″ square, with a bazillion 4″ curved patches. The design is by Anne at Springleaf Studios, and she did it as a Christmas Quilt-Along in 2015. I love her fabrics, but I used what I had. This is similar to my Spring Violets quilt from 2014. It’s a Drunkard’s Path variation. A regular Drunkard’s Path is easier to piece because the “legs” aren’t so exacting. “Beach Drunk” is a good example of a regular one. I used Superior Threads’ Fantastico in red and green to quilt the flowers and leaves, and Bottom Line in light green for the background and bottom thread. The back is a wonderful green and white leaf print that I though was perfect. So did Yuri. This is for sale in my Etsy Shop. And a nice scrappy binding! Hope you are finishing something. Categories: Finishes | Tags: drunkards path, Evening in the Garden, superior threads, Valerie Root, Yuri | Permalink. This week I quilted and bound Pacific Stars. 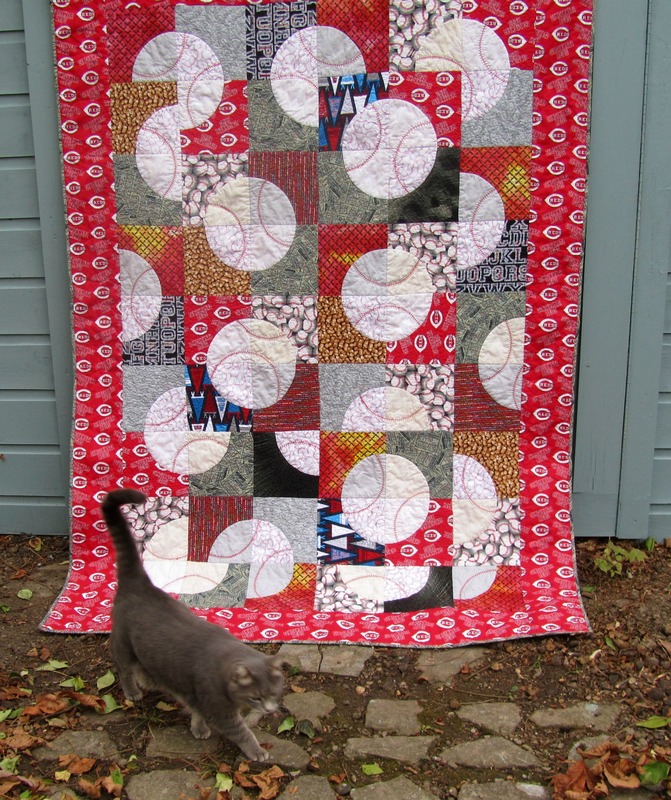 This is the mystery quilt by Charlotte Scott (The Slightly Mad Quilt Lady), featured over at Carol’s Quilts. I started the first clue in June, and I have to say that it remained a mystery until the end! I think it turned out great. I don’t think the pictures really do it justice. I don’t usually make medallion quilts, but isn’t this fun and starry? 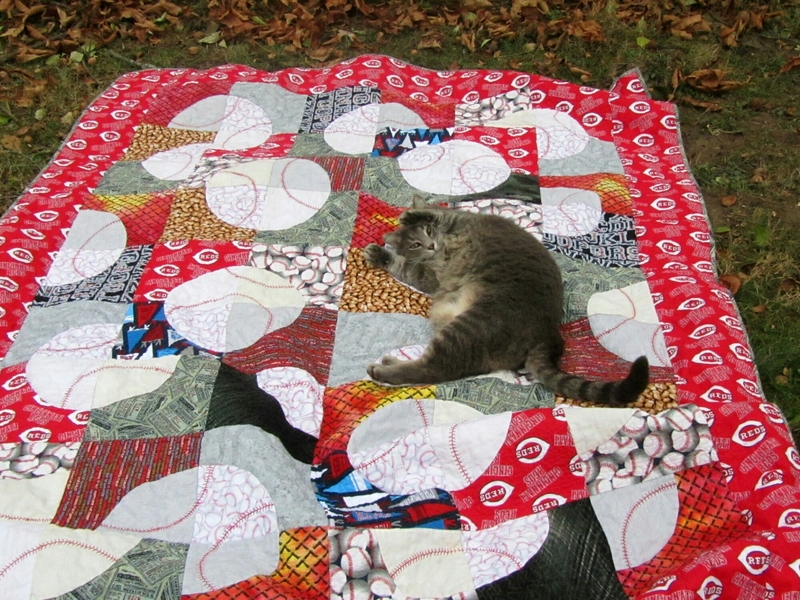 And I’m not a big fan of square quilts, but this is the second one in a row. The top is quilted with teal Living Colors and gray Rainbows from Superior Threads, and the bottom is Bottom Line. 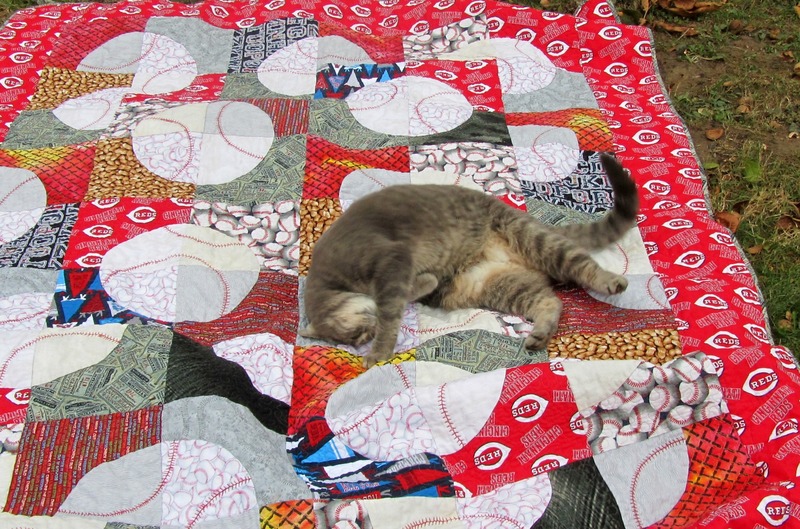 This used a lot of scraps, and turned them into a beautiful and unusual quilt. I hope you’re finding time to finish projects! Categories: Finishes | Tags: Evening in the Garden, Pacific Stars, superior threads, Valerie Root | Permalink. This quilt seemed to take forever, but it was really only about a week of sewing. The customer started talking to me about it in early August. We arrived at a design, then she chose all her fabrics, then sent the links to me, I ordered the fabric, and then awaited it’s arrival. I started sewing the first week in October, but stopped to do other projects while waiting for that last piece of fabric to arrive. By that time, I had the back and binding made, so construction went smoothly. These are big geese, ten-inch blocks! Quilting took a little longer, because a lot of it was straight lines with the walking foot. At 70″ x 90″, this was fairly large and took a lot of free-motion quilting after the lines, but after the Layer Cake Explosion, it was a breeze! It’s all quilted, top and bottom, with Superior Threads Bottom Line in silver. I should get this in the mail on Monday. Whew! I’m enjoying seeing your finishes this week! I’m linking up to Finish it up Friday at Crazy Mom Quilts. Categories: Finishes | Tags: Evening in the Garden, flying geese, superior threads, Valerie Root | Permalink. 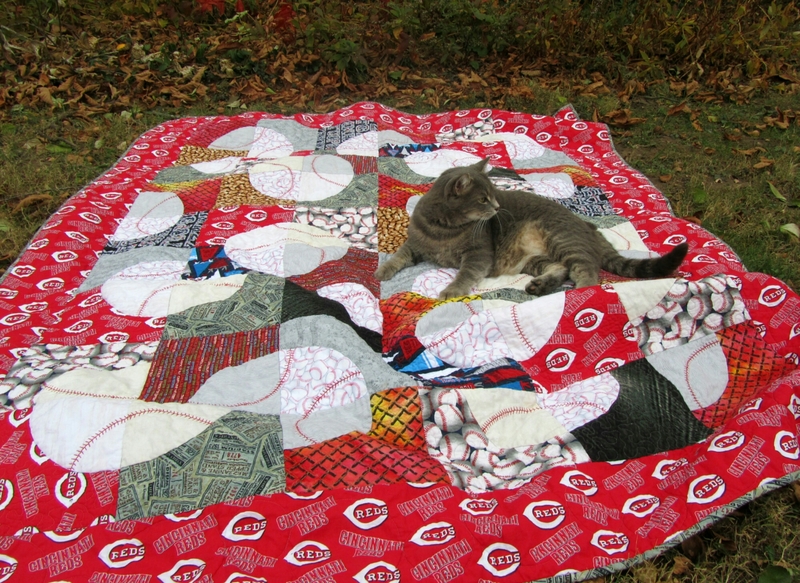 Yuri and I are here to show you the finished Baseball Quilt. This is for a sick friend who may need a little extra hug to get through till pitchers and catchers report. The back has a Mets theme, if you can’t see it. The big 8″ Drunkard’s Path blocks (I made templates from a cereal box!) went together very quickly. Then came the quilting. I used dark gray Bottom Line on the top and bottom for most of it. 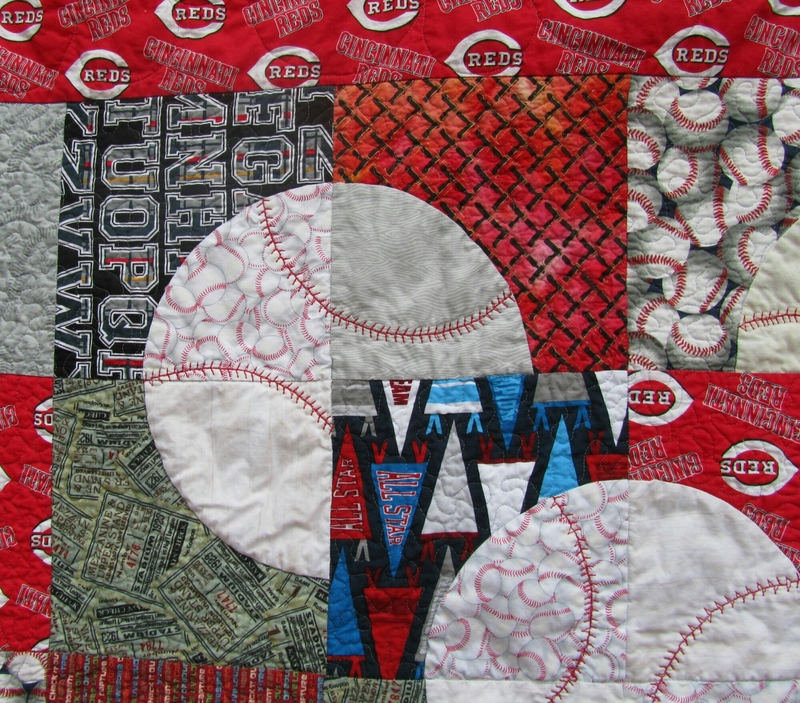 I stitched in the ditch between all the blocks first, mostly to make sure the baseballs were anchored down. Then I stippled all the background pieces, and outlined the baseballs. Finally, I used one of my machine’s decorative stitches (Bernina #23) with red 30 wt. thread to make the stitching lines. I had to stitch each line twice, once normally, then once in the mirror image. They’re not as even as I would like, but I think they work. 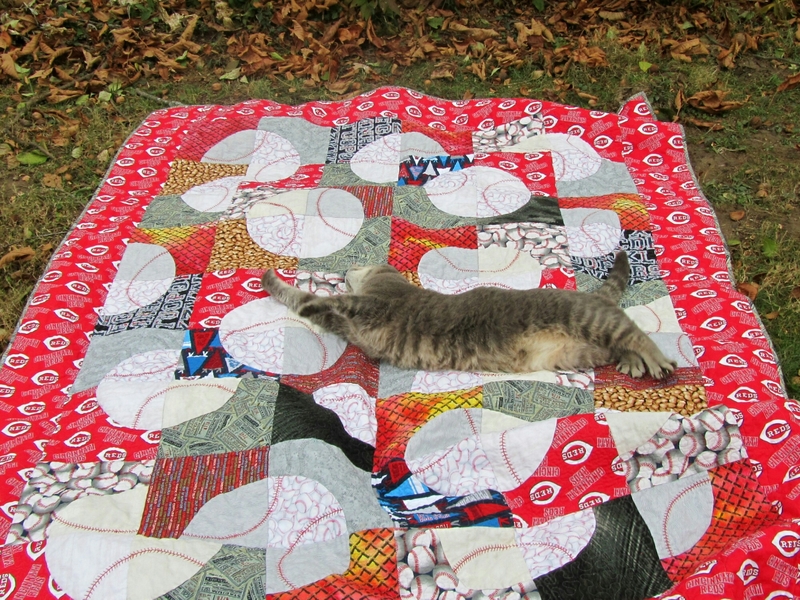 And here’s Yuri to demonstrate the resulting snugglebility of the finished quilt. Categories: Finishes | Tags: drunkards path, Evening in the Garden, superior threads, Valerie Root | Permalink.